we know that planning is stressful, the details can be overwhelming, and it all feels so important. That’s why we’re here - to take the stress away, and make the custom stationery process easy and fun for you! One + Only Paper is a boutique stationery studio specializing in creating custom, one of a kind invitation suites. Our process is designed to take every detail of your love story into account, and bring you stationery that you will cherish long after the wedding is over. One + Only Paper currently offers two tiers of service - bespoke stationery through One + Only Paper, and OO Paper Co. How do you know what’s right for you? - Begins the process at least one year in advance of her wedding date. - Loves stationery, and is open to considering unique printing processes. - Desires to surprise and delight her guests, and understands that the invitation sets the tone for the entire event. If this sounds like you, read on! If you’re not sure this is right for you, we invite you to take a look at our main tier of service, OO Paper Co. The first step in the process is a consultation. In addition to learning all about you and your wedding, it’s also a chance to connect. Invitation design can be a highly personal process - here at One + Only Paper we strive to have mind reading abilities, and that happens when we get to know you as a person. Consultations usually last around 30 minutes, and can be scheduled over the phone. To schedule your consultation, click here to fill out a consultation request form. During the consultation, you will receive a customized estimate, timeline, and design proposal for your invitations. After our consultation, we’ll send over your proposal, updated with everything we discussed during your chat. When you’re ready to move forward, you can just complete the proposal by accepting the proposal, signing the contract, and paying a 50% deposit. You’ll then receive your finalized timeline, and wording guide, and we’ll officially kick off the project. The first step in the design process is a sketch of your invitation. This will be a more fleshed out version of your design proposal, and will cover art, placement, and general directions for colors and papers. We’ll schedule a quick phone chat to talk it all through, and we are happy to make edits for you until you’re completely thrilled with your sketch. Once it is approved, we’ll move forward into creating your art and invitation design. The next time we’ll meet is to look at a digital proof of your invitation design. This is the fun part! After the meeting, we’ll make revisions until everything is absolutely perfect. After you’ve approved the proof, it’s time to sit back and relax, because your work is done. Your invitations will arrive fully assembled, and all you’ll have to do is seal the envelope and pop them in the mail! I AM ALISON, the owner of One + Only Paper. I started this company because wedding stationery combines some of my favorite things - art, beautiful printing processes, and celebrations! I think love should always be celebrated, and my goal is that when your guests open your invitations, they will be as excited about your wedding as you are! One + Only Paper was founded in 2013. After graduating with a degree in graphic design, and pursuing a career in web design, I realized that my celebratory nature was more suited for stationery design. Today, I work with couples who are so excited to be married, and know that their wedding is an opportunity to to gather all their most favorite people in one place, and have the celebration of a lifetime, surrounded by love. Alison was so sweet to work with, and she is extremely talented. I knew I wanted something personalized and I wanted to see invitations in person before choosing. She helped me personalize an invitation that I loved and was so flexible throughout all my changes and new ideas. I also loved that she worked within my budget and never did I feel pressured to buy the top notch package or choice. After loving the invitations, I also had her do my programs, table numbers, and wedding party name cards. I loved how they all complimented each other. I kept finding more for her to do because everything looked so perfect. I loved working with Allison and I would recommend her to to anyone who wants a very unique, special, and personalized wedding invitation suite. Thank you so much Alison!! I absolutely loved working with Alison at One & Only Paper. I am not the most creative person and I was looking for someone to be able to take what I wanted and put it into realty when it came to the save the dates, invitations and programs. Alison went above and beyond what I had invisioned. She was able to incorporate my husband and I's theme of rustic/modern and create awesome invitations. Everything was perfect and I could have not asked for anything more. Mine included a personalized map, poster with our wedding hashtag for a scavenger hunt, a puzzle save the date, but still they were simple and us. Loved it ALL! I was unable to find the wedding invitations I had envisioned at traditional stationary companies and decided to go with custom invitations by One + Only Paper. I was able to meet with Alison in person several times and discuss ideas and options with her. 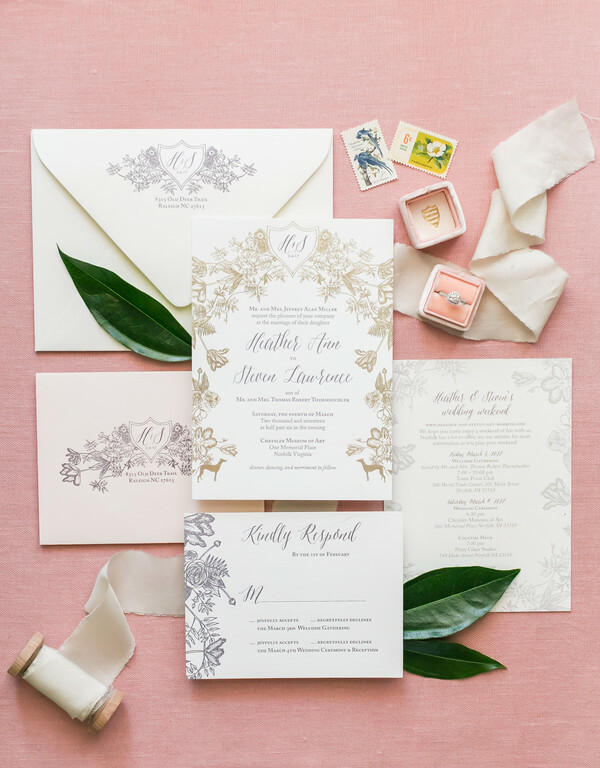 She created save-the-dates, invitations, thank you cards, ceremony programs, and a custom monogram that, while all were individual creative projects, coordinated to make a cohesive stationary suite. Working with Alison of One & Only Paper was such a delightful and pain-free experience! They take much care in their work, and pay close attention to detail. They were thorough in their intake process, and went above and beyond in creating all stationery for our wedding. Alison was accessible, professional, and reliable, always hitting the timelines and giving status updates along the way. Most importantly, they created a stunning final product. They helped me make sense of all the inspiration I put together, and how it would fit with the venue and our outfits. They did not simply implement instructions; they offered excellent guidance and vision, making the final product a perfect reflection of the day. I could not have been happier with the stationery they created, the level of service, and my overall experience working with them. I would highly recommend them to any bride, groom, or others looking for exceptional design and print experience! I love brainstorming fun ideas to make your wedding unique - if you’re looking for something and you don’t see it here, reach out! We ask our bespoke clients to reach out to us at least one year before their wedding date. If you are less than a year away from your wedding, we invite you to visit OO Paper Co, our main tier of service, where we are able to accommodate shorter timelines. DO YOU MAKE ALL OF YOUR OWN ARTWORK? Yes! Almost all the paintings and drawings you see are the work of owner Alison Hazinski. We strive for a very personalized aesthetic, which means for our bespoke clients we will create artwork just for you, not to be used in any other project. We will occasionally use work from other artists, either at our client’s request, or if the project calls for a very specific look (like vintage botanical illustrations). We do not. Printing is an art form in itself, and in order to provide the best quality for our clients, we outsource printing to a select group of trusted vendors. WHAT DO I NEED TO BE PREPARED FOR MY CONSULTATION? If you are able to fill out our consultation request form, you should be all set for your consultation!